There was a time, after I became a single mom, that my daughters and I were living in a small apartment and our dining space had to do double duty. My older daughter recently made the comment that she grew up thinking it was normal to have a sewing machine at one end of the diningroom table. I just saw the sewing machine as a better option than their absent father at that place at the table. I have a feeling that the sewing machine may once again occupy a place at my table when I move into my small apartment in a few months. 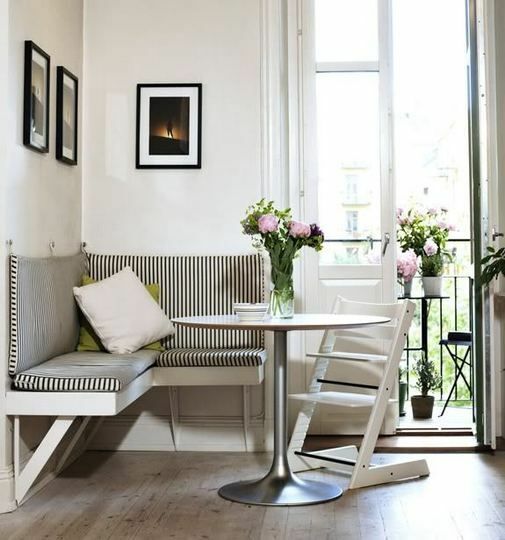 Small spaces create some unique dilemmas for those of us who do not want to spend our dining time sitting in a recliner while eating our meals. I guess I am just old fashioned enough to want to set a pretty place at a table and sit down to a nice healthy meal. 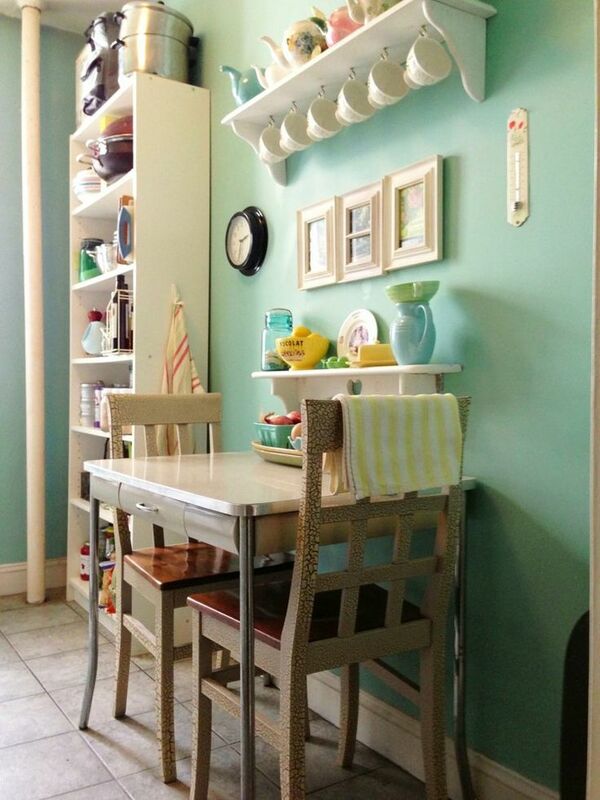 If you are lucky enough to have space in your small kitchen for a table this is a pretty cute one. I love the drawer in the table, which would be a handy place to store your flatware. If all that you have is a small corner, how about some built in space saving benches and a round table. Depending on how you cover the cushions or what style table you use, this would work for most decorating styles. Here a very small nook has been made cozy with lots of pillows. How about a kitchen island that can also be used for a dining table. Great use of space. I'm loving these chairs. Vintage and turquoise!!! Hmmm, I'm not sure about having a ginormous human anatomy chart over my dining table, but I guess there is a style for everyone. Living in a small space doesn't mean that we have to give up a cozy eating spot. It just means we have to get creative with the use of the space. P.S. More small space living ideas here. I love these ideas, Laura! I actually look forward to seeing how compact I can make a living arrangement in the future. Love these small spaces Laura. Love the first one. How quaint to be able to dine and look out the window. Very cozy and sweet. I love looking out the window too, Kris when I am dining. Hope I can do that when I move. I love small nooks with benches! They are so cozy feeling. 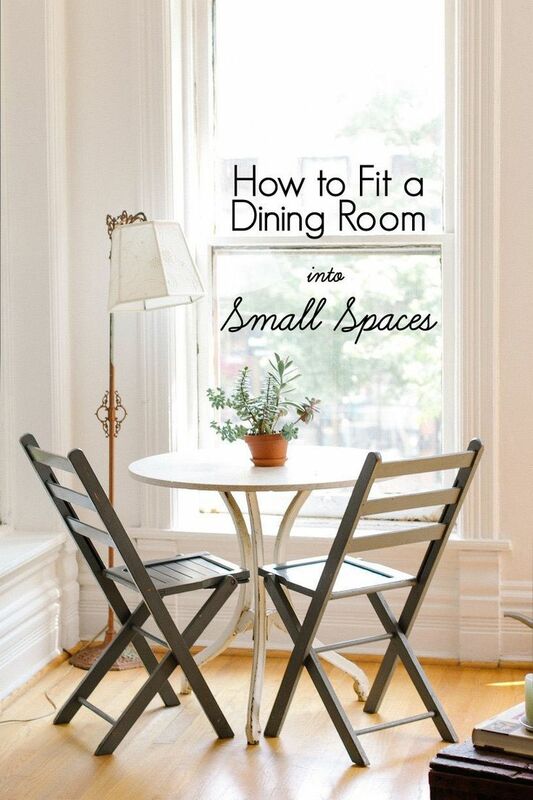 I love all these small dining spaces you've shared. Just personalize the space the way you want and you can make any small space your own. Love the dining areas with the windows! It's amazing what you can do with a small space these days. It's all about how smart you use your space I guess. Those were great inspirational pics. I thought the one with the anatomy chart hanging over it was a bit odd too. A place without a spot for at least a table and chairs for two...would be a deal breaker for me. Some cute ones here. Thanks! Love these ideas! 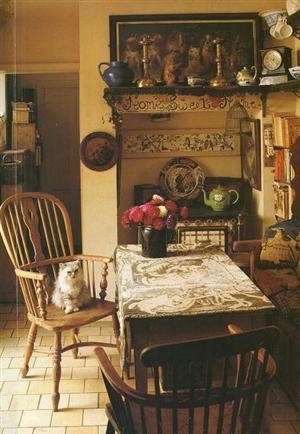 People are becoming so creative in making small spaces so lovely and inviting! Love these!! A bistro set? I love those! These are all darling, Laura. Love the sewing machine/absent father remark. Have a great week. 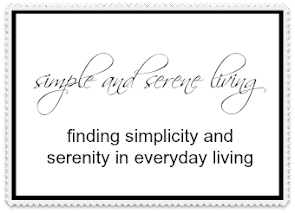 I love your inspiration pictures, Laura!